Shown below is a definition sketch of the two-zone groundwater model that is used in InfoSWMM H2OMap SWMM InfoSWMM SA . The upper zone is unsaturated at a varying moisture content of θ. The lower zone is saturated and therefore its moisture content is fixed at the soil porosity h.
Shown below is a definitional sketch of the two-zone groundwater model that is used in InfoSWMM H2OMap SWMM InfoSWMM SA. The upper zone is unsaturated with a variable moisture content of θ. The lower zone is fully saturated and therefore its moisture content is fixed at the soil porosity ϕ.
fG lateral groundwater interflow to the conveyance network which depends on the lower zone depth dL as well as depths in the receiving channel or node. After computing the water fluxes that exist at a given point in time, a mass balance is written for the change in water volume stored in each zone so that a new water table depth and unsaturated zone moisture content can be computed for the next time step. Note that when conditions warrant, the lateral groundwater flow can be negative, simulating flow into the aquifer from the channel, in the manner of bank storage. 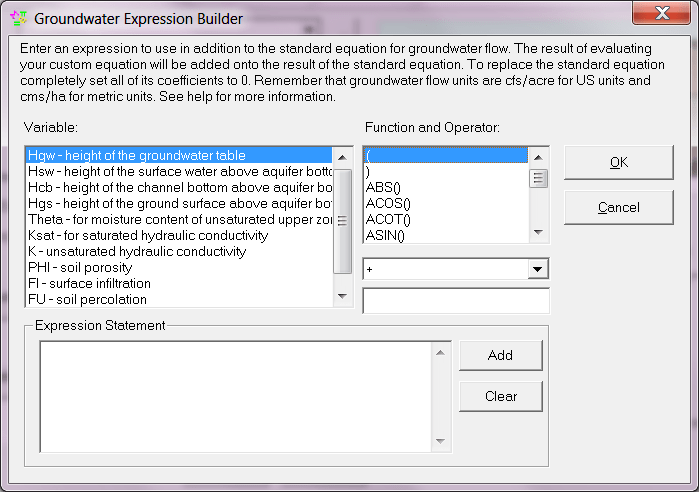 An exception occurs when A3 ≠0, since the surface water – groundwater interaction term is usually derived from groundwater flow models that assume unidirectional flow. Otherwise, to ensure that a negative flow will not occur, one can make A1 greater than or equal to A2, B1 greater than or equal to B2, and A3 equal to zero.